Rev. 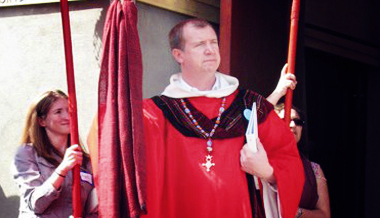 Paul Fromberg is the rector of St. Gregory of Nyssa Episcopal Church in San Francisco California. From 1987 – 2004 he served at Christ Church Cathedral and St. Andrew’s Church, Houston. Paul is an iconographer and multimedia artist. He has taught courses in liturgics and congregational development at Virginia Theological Seminary and has a Doctor of Ministry from Church Divinity School of the Pacific. He is also a consultant with congregations across the country. He has been a speaker at the Wild Goose Festival and the Greenbelt Festival in Great Britain. Paul Formberg on transformation and presence. Paul Formberg art, the church and beauty. Paul Fromberg on art and the church.